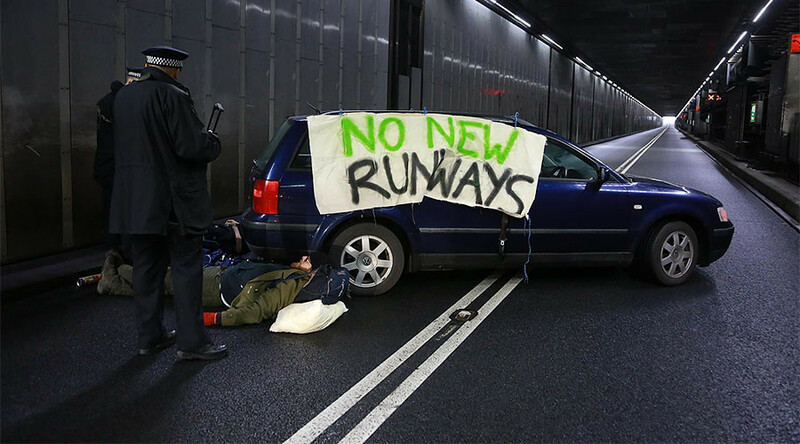 Climate change protesters have blockaded a motorway tunnel leading to Heathrow Airport in protest against a planned third runway being built. Major delays on the M4 are causing chaos for airport passengers. Activists used a vehicle to block the tunnel leading to the airport before chaining themselves to it and lying down on the road on Tuesday morning. Two drivers of two other vehicles blocking the tunnel have been arrested, according to the Evening Standard, while officers work to remove the people attached to the third car. The protest was staged by campaign group Rising Up, which works to tackle climate change. Motorists and holidaymakers have taken to social media to vent their frustration. Stuck in this #Heathrow traffic. It's bumper to bumper. Anyone know what the protest is about? It was Black Lives Matter last time. “The actions of these protesters are selfish, short-sighted and counterproductive. Most local communities living near Heathrow support expansion and passengers simply want to be able to use the airport in peace,” said Campaign group Back Heathrow, which supports the airport’s expansion. A spokesman for Heathrow Airport said that “Heathrow Airport can confirm that a protest activity is on-going in the inbound tunnel to Terminals 2 and 3. “Heathrow supports the right to peaceful protest within the law, but the safety and security of our passengers, aircraft and colleagues together with the smooth running of the operation is paramount. The plan to build a third runway at Heathrow was agreed in October as the government’s preferred option for increasing capacity in southeast England.